Anthony Rodriguez was playing soccer with friends when the ball got away and he went into tall grass to retrieve it. 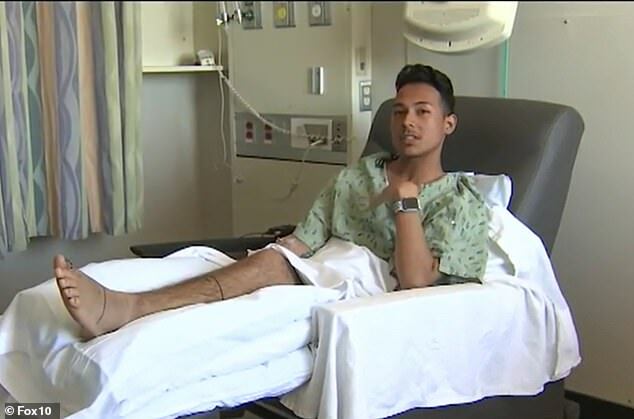 That’s when a rattlesnake bit his left big toe and the 17-year-old had to be rushed to his local hospital in San Antonio, Texas. Doctors administered traditional antivenom medication, but Rodriguez’s face began to swell up to the point where he couldn’t open his eyes, reported Fox 10. A new antivenom drug had just been approved by the FDA but the hospital didn’t have it. So the teen, who is now recovering, had to be airlifted 962 miles to Banner University Medical Center-Phoenix in Arizona, which did carry it, so he could be treated. Rattlesnake bites are venomous, meaning they inject a poison into the victim, but they don’t normally bite humans unless they are provoked or feel threatened. Symptoms of bites include bleeding, difficulty breathing, blurred vision, change in skin color and numbness. Until you can get to a hospital for antivenom medication, doctors recommend washing the wound and then applying a bandage. On rare occasions, a person bitten by a snake can go into anaphylactic shock. Rattlesnakes are responsible for the majority of the 7,000 snakebites that occur in the US each year, but fewer than five people die from them, according to Medical News Today. Rodriguez was rushed to the local hospital where he was given CroFab, a traditional antivenom medication that contains the antibody immunoglobulin G to neutralize venom toxins. Unfortunately, the teenager suffered an allergic reaction. ‘My eyes started getting swelled up bad, started getting puffy and they said they had to stop it,’ Rodriguez told Fox 10 Phoenix. He was flown to Banner University Medical Center-Phoenix, which is carrying a new type of antivenom called Anavip. CroFab had been the only medicine approved for rattlesnake bites since 2000, but the US Food and Drug Administration approved the new drug this year. Banner Medical Center has treated 18 rattlesnake bite patients since February. Rodriguez (pictured) was able to fly back to Texas on Monday. In clinical trials, Anavip was shown to stay in the body longer so it prevents complications like bleeding. CroFab has also been shown to cause allergic reactions in people who are treated for rattlesnake bites more than once. According to Dr Steven Curry, director of the department of medical toxicology at Banner, the older antivenom was made in sheep and the newer one is made in horses. ‘It’s also structurally different in that it lasts longer than the other anti-venom, so we are hoping it will be less likely we will see the re-occurrence in swelling or blood problems in people receiving it,’ he told CBS 5. Banner has treated 18 rattlesnake bite patients since February, although usually the numbers are not this high so early in the year. Rodriguez flew back to Texas on Monday and said he is thankful the new medication worked for him. ‘I’m pretty lucky because it could have been really worse without the antivenom,’ he said.